My friend Linda has collected a yearly ornament for at least 10 years. I didn't understand why she liked them so much. It seemed strange to me.... hanging all of the old year ornaments on a tree. After all, everyone could tell when you purchased them. Pottery Barn used to carry them....but no longer. I guess not many people saw them the way Linda did. Now she has me collecting them too. She hangs each year from her chandelier. As we celebrate the New Year at her home, I look up and see all of them hanging down. As Linda and Bill's friends sit around the table laughing, talking and eating the ornaments shine in the candlelight. They remind me of the years we have celebrated together and all of the years we have been friends. This one is hanging from my chandelier. I'm so thankful for all of your comments and friendship this past year. Wishing all of you much happiness and joy in the New Year!!! I do think that yearly ornaments can be a wonderful reminder of years past, and great memories. I like your ornament! Happy New Year to you and yours. I kind of like that idea, too. Happy New Year to you and Barb and your families. Thanks for all the joy you bring to us BBD junkies. 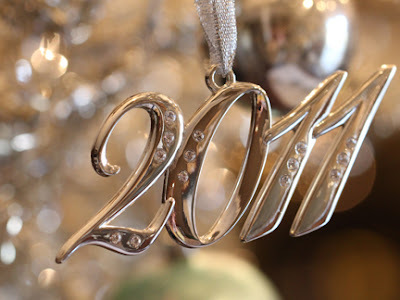 I can't wait to see what surprises you have in store for 2012. And to you too! 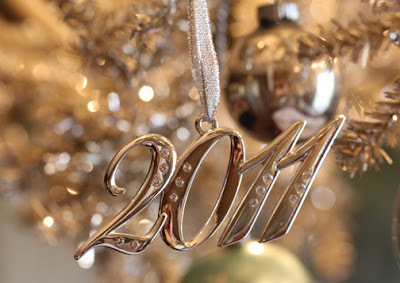 May you know Peace, Love & Joy in 2012! I think that is a beautiful idea. Happy New Year! What a lovely sentimental thing to do. Thank you for all of the wonderful designs that you have given us to stitch this year. Here's cheers to both of you and Cheer's to the New Year. Happy New Year to you and your's! Love the idea of the yearly ornaments. Never thought about it. But what a great way to remember the year and all it's memories! Lovely ornament - what a lovely way to remember the year. Great idea! Happy New Year to you too! What a lovely, classic ornament. Many happy returns! I love the thought of yearly ornaments - as you are collecting them, are you getting all the previous years that you missed? Wouldn't that be something! Happy New Year to you and Barb, I am looking forward to seeing what you gals do next! PS Where did you get this ornament from? You can find them at Target and/or Hobby Lobby....wish Pottery Barn still did the yearly ornaments! Happy new year to you and your family and thank you for sharing your creativity with us all. You almost got me started on collecting those sweet little German animals that you hang from your tree. I saw a site that had hundreds of them for sale on ebay. I bought some blueberry crumbcake instead. Happy New Year! As we grow older, traditions seem to become more important. Best wishes for a wonderful year in 2012 to you & yours. Hope you have a happy, happy new year Alma!!!! Happy New Year from Belgium! And thank you for all your beautiful patterns, I love them so much! Happy new year for both of you !! I wish you health, friendship and creativity ! wow Alma...I think I can do this...it doesn't entail cooking! lol I bet they were beautiful in the light! This post is very original! I wanted to send you a picure of my completed quilt using your fabric line, but can't seem to find an email for you! You can see it on my site. It is very nice. Sorry for my english that It is not good. I am not sure where to ask this question - but I am doing the Anniversaries of the Heart series on one piece of linen. The directions say to leave 3 stitches between each month - does that mean 6 threads? I know I am late to the party on this one but I am determined to complete it! Yes, 3 stitches will be 6 threads....hope you enjoy stitching this one! Happy New Year to all of you. Stay blessed and happy.